This page contains sample images from our models as work progressed since 2000 (with updates during 2004, 2011, and 2014). Please note that the renderings here are from work that is, in some aspects, incomplete, in its modeling, its texturing, and its lighting. We will specifically state when a render depicts a completed feature. Be sure to scroll down through each category to find the latest renderings. In 2011, renderings and animations from our updated and revised model of the site were included in another History Channel program on the site and other ancient monuments. In 2006, visualizations extracted from our model were included in Martha Lubell's award-winning Queen of the Mountain documentary. Theresa Goell started her career as an archaeologist with four strikes against her: she was a female, divorced, a Jew working with Muslims, and hearing impaired. But with unshakeable determination, Goell abandoned the comfortable yet restricted lifestyle of her conservative Jewish family in 1933 to pursue her passion at Nemrud Dagi, an isolated mountaintop in Southwestern Turkey that had eluded archaeological attention for centuries. Considered the eighth wonder of the ancient world, Nemrud Dagi had been shrouded in mystery until Goell's pioneering excavations. Struggling with a hearing disability, her work at the site was nothing short of extraordinary, bringing roads, tourists, and employment to the impoverished local population. After living most of her life as an outsider, Goell became "queen of the mountain," gaining worldwide attention for her work and finding a new home among the Kurdish community there. The film was produced and directed by Martha Goell Lubell. Her tender film takes the shape of an epic adventure; Goell's saga comes to life through breathtaking National Geographic archival footage of the excavations, hundreds of family photographs and finally Goell's stunning oral history and letters, read by acclaimed actress Tovah Feldshuh. Lovingly restoring the legacy of this pioneering Jewish woman, Queen of the Mountain offers a unique and intriguing portrait of an eccentric spirit and a true American original. 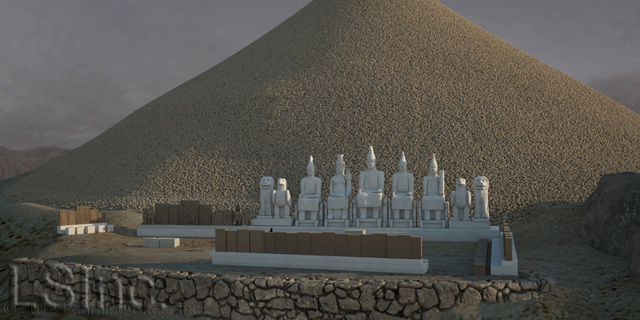 In 2001, renderings from an early version of our 3D model of the entire site were used by Ekip Film, Ltd., a Turkish documentary film company, in their television movie about the site, its excavation, and the travails of King Antiochus against the Romans (entitled Mount Nemrud: the throne of the gods). Visuals from that same model were also incorporated into the History Channel's documentary about the discovery, excavation, and publication of the site (entitled The Hidden Tomb of Antiochus). In 1995, our very first (and now archived) virtual reality model of Nemrud Dagi was an early demonstration of the ability of virtual archaeological worlds to be more than pretty pictures and incorporate instructive linked text, image, and narration databases. Some of the visuals shown here are available for purchase for use in any noncommercial educational context from the Institute for the Visualization of History (click on the Products button). The East Terrace contains many ritual and sculptural features arrayed around the four sides of the rock-hewn flat central space. At its east, there is a stepped flat-topped pyramid (possibly for a Persian fire altar); at the north and south edges are lines of orthostates depicting King Antiochus' maternal and paternal ancestors; and resting atop a high podium majestically overlooking the terrace below, are seated a pantheon of colossal gods (ca.8m high) flanked at each end by colossal eagles and lions (the rendering at the right is from the completed model, 2014; hover over to enlarge). East Terrace view from the east toward the podium from the approximate location of the ancient approach up to the site (rendering at the left from the 2011 version of the site model; hover over to enlarge). East Terrace view from the east toward the podium from the approximate location of the ancient approach up to the site (rendering at the left from the 2000 version of the site model; hover over to enlarge). East Terrace podium with colossal statues, dexiosis reliefs, and flanking stairs (from the nearly completed model of early 2000; hover over to enlarge). East Terrace aerial photo composite showing our model progress accurately situated on the existing landscape (from our ongoing model from early 2000; hover over to enlarge). 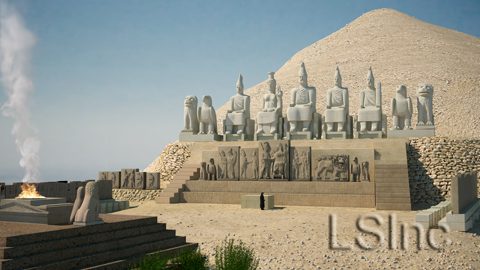 Seated majestically across the west side of the East Terrace, with the magnificent 50m-high tumulus as a backdrop, is King Antiochus' pantheon (in which he included himself; see our 2014 rendering at the left; hover over to enlarge). 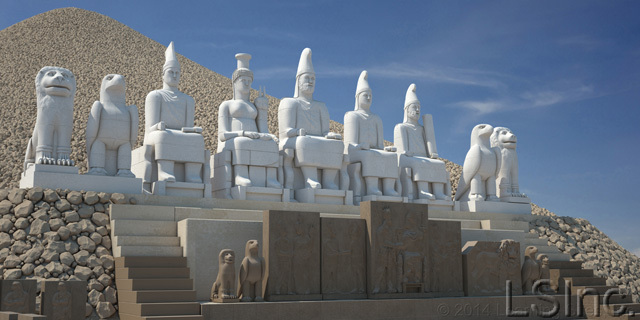 The colossal enthroned gods rise 15m above terrace level, seated atop a high stepped podium. They are constructed architectonically of ashlar limestone blocks, only sketchily carved, and draped in regalia from deities of the Greek West and the Parthian East. Across the backs of the thrones is carved one of the longest known Greek ritual inscriptions, explaining the ceremonies to be held at the site. East Terrace colossal Apollo; head as currently preserved (c.1.6m high). Photo © 1955 Theresa B. Goell (hover over to enlarge). 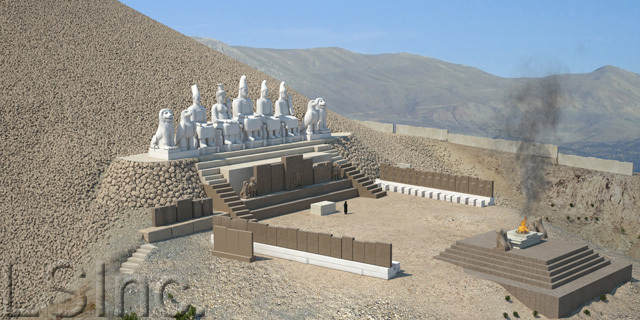 East Terrace colossal Apollo; full atatue as modeled by Learning Sites in 2000, second from the right among the colossi in the reconstruction above (hover over rendering at the left to enlarge). View from atop the tumulus looking over the East Terrace to the backs of the colossal enthroned gods (rear of Apollo, second from the left, is c.5m high). Photo © 1985 Donald H. Sanders (hover over to enlarge). East Terrace colossal Apollo; back, from an early model (2000) by Learning Sites. The West Terrace has the same features as those displayed on the East Terrace (except for the Stepped Pyramid), but they are arranged quite differently due to the topography of the mountain on that side. The major differences in the design of the West Terrace are: (1) there is no great stepped podium upon which the colossal gods sit; (2) the row of maternal ancestors are set opposite the colossal gods, rather than along the side; and (3) the dexiosis (or apotheosis) reliefs are set next to the colossal statues, rather than below (compare the image at the left, from our latest  version of the model with the East Terrace images above; hover over to enlarge). West Terrace, close-up view (at the left from our 2001 version of the model; hover over to enlarge) showing the dexiosis reliefs and colossi aligned on the same low steps. Guarding each side of the major sculptural groups at Nemrud Dagi are a pair of lions and eagles. The colossal guardian animals on either side of the colossal enthroned gods have all been destroyed, except for parts of their bodies now strewn across the terraces. Some of the heads are in fair condition, as you can see from the lion's head to the left (currently c.1.3m high; hover over to enlarge; photo © 1953 Theresa B. Goell). Our 3D computer reconstruction shows for the first time what this wonderful lion might have looked like. East Terrace north colossal lion as modeled (2000) by Learning Sites. Displayed along the north and south sides of the East Terrace are rows of stelae, upright slabs of sandstone, set into a stepped limestone plinth. The courtside of the slabs are carved with depictions of Antiochus' ancestors in order back to Alexander the Great on his mother's side (the southern sequence; see the rendering at the left from an early, 2000, model; hover over to enlarge), and to Darius the Great on his father's side (the northern sequence). On the back of each stela is carved the name and immediate parentage of the ancestor depicted on the obverse, making the line of ancestors the longest and most complete ancient genealogy known (despite its current ruined condition). 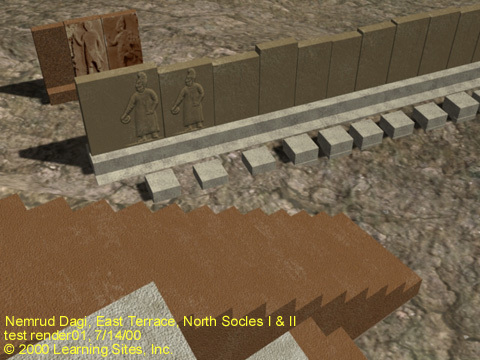 East Terrace, Persian ancestors (detail from the 2000 early model of the site; hover over to enlarge).